Mitochondria provide the cells' energy requirements. In the same way as cell nuclei they have a double membrane. The outer membrane of a mitochondrion is smooth while the inner membrane forms folds called cristae to increase the inner membrane's surface area on which sugar combines with oxygen to produce ATP - the cell's primary energy source. Chloroplasts are green (because they contain the pigment chlorophyll) and are members of a class of organelles called plastids. They capture light energy, store it in the molecules ATP and NADPH, then use it to produce organic molecules and free oxygen from carbon dioxide and water by the process of photosynthesis. 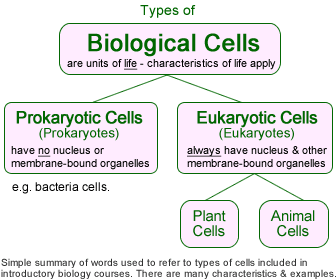 See also prokaryotic cell structure, animal cell structure, plant cell structure and an introduction to cell division.